Build immediate credibility with customer and prospectives. EQUIPT partnered with Commercial Van Interiors to provide a single source for all interior and exterior vehicle needs. Our combined workspace, assessment center and installation facility delivers customers a seamless solution. We are driven by our mission to help keep you safe, more productive, and show the world what you do. Every detail is important at EQUIPT Graphics Solutions. We begin with the lifecycle cost of your program in mind and build every single step in the process around a total solution for your business; no detail is overlooked. Our business is built on your complete satisfaction. Businesses of all size have needs of all sizes. We work with every vehicle type, from on-campus maintenance vehicles to delivery and sales cars. 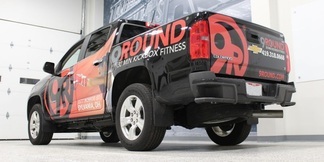 We transform your small vehicles into high-impact marketing machines that drive business and name recognition. Commercial vans and trucks are the mobile offices of all trades. Developing or executing a brand that shows the world what you do is what EQUIPT is all about. With brand development as unique as your talents, your service vehicle can become your calling card in the market. EQUIPT is built to handle even the largest assets you own. 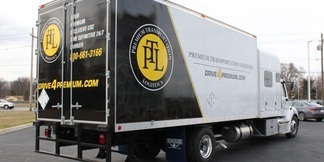 We can develop and execute your design for cab-chassis units, box trucks and even 53′ trailers. Our incredible facility can house any size vehicle in any weather. Make the most of your advertising space. EQUIPT Graphics Solutions was founded by three of the most experienced and proven leaders in the fleet graphic market. With over 65 combined years of brand development and program management on vehicles for Fortune 1000 companies, we can provide unparalleled insight and services that your company deserves. We recognize that 99.7% of US Employer firms are classified as small businesses (under 500 employees) and we are here to help you show the world what you do! Small businesses generate 13 times more patents per employee than large patenting companies. If the 66 million small businesses in the U.S. were a country, it would be the 17th most populous country in the world. Over 50% of the 120 million Americans in the workforce work for a small business. A small business is defined as an enterprise that has fewer than 500 employees. Is your brand EQUIPT for success? 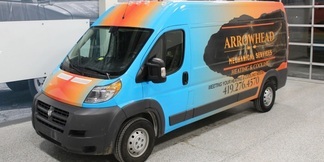 Vehicle graphics are one of the most cost effective ways for small businesses to advertise a product or service. A professional vehicle graphics design can make a great first impression, build instant credibility in your market, and increase awareness for your business. Below are compelling stats on how powerful a well-planned vehicle graphics program can be for small businesses. The next-generation Mercedes-Benz Sprinter van has been caught again by our spy photographers. This time, the van was found on some twisty mountain roads, and in a larger passenger van/bus configuration. It still appears the new generation won’t look radically different, except for the front fascia.